by so many to so few." Are you a relative of one of the Battle of Britain airmen on the Monument ? Percival Stanley Turner was born in Ivybridge, Devon on 3rd September 1913. His family emigrated to Canada shortly afterwards. They settled in Toronto and Turner did an engineering course at the university there. He joined 110 Squadron of the Canadian Auxiliary Air Force as an airman. 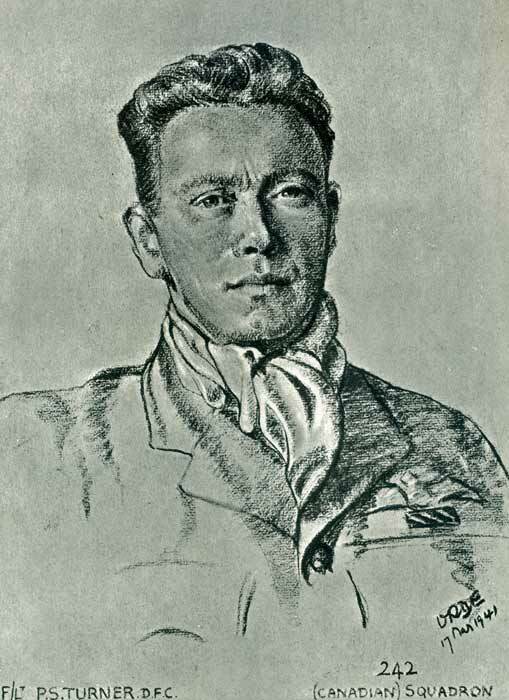 In November 1938 Turner went to England and joined the RAF on a short service commission. He completed his flying training in September 1939 and was sent from 7 FTS Peterborough to No. 1 Fighter Training School at St. Athan. Turner converted to Blenheims and was posted to 219 Squadron at Catterick when it reformed on 4th October 1939. He returned to St. Athan on 27th October, converted to Hurricanes and joined 242 Squadron at Church Fenton on 20th November 1939. He was sent to France on 14th May 1940 and attached to 607 Squadron. He moved to 615 Squadron on the 16th and returned to England on the 19th, when 615 was withdrawn. Between 25th May and 1st June Turner destroyed five Me109's, probably another three and damaged one. On 8th June 242 Squadron went to France to help cover the retreat of the Army to the Atlantic ports. Turner destroyed two Me109's on the 9th. The squadron was withdrawn on the 16th and Turner was attached to the AFDU at Northolt from 1st August for a Fighter course. On 7th September Turner damaged a Me109, on the 15th he was made a Flight Commander and on this day he destroyed two Do17's and probably a Me109. He was awarded the DFC (gazetted 8th October 1940). On 8th February 1941 he shared a Do17. Turner was posted to command 145 Squadron at Tangmere on 13th April. He damaged Me109's on 26th June and 14th July and destroyed another on 29th July. He was awarded a Bar to the DFC (gazetted 5th August 1941). On 22nd October 1941 Turner was posted to HQ 42 Group, Northern Ireland on staff duties. He was given command of 411 (RCAF) Squadron at Hornchurch on 17th December. In February 1942 Turner was posted to Malta to command 249 Squadron. He destroyed a Me109 on the 22nd and on the 23rd was shot down, crashing near Luqa and going to hospital. He rejoined the squadron on 10th March. Turner damaged another Me109 on the 18th and was posted away in April to take charge of the Fighter Control Room at Valetta. In late August 1942 Turner went to RAF Heliopolis and on 10th September was sent as an observer on HMS Coventry on a combined operation against Tobruk. The ship was sunk and Turner was rescued from the sea by a destroyer. In January 1943 he took command of 134 Squadron at Shandur and in June took over 417 (RCAF) Squadron at Ben Gardane. The squadron moved to Malta in July, to prepare for the invasion of Sicily. 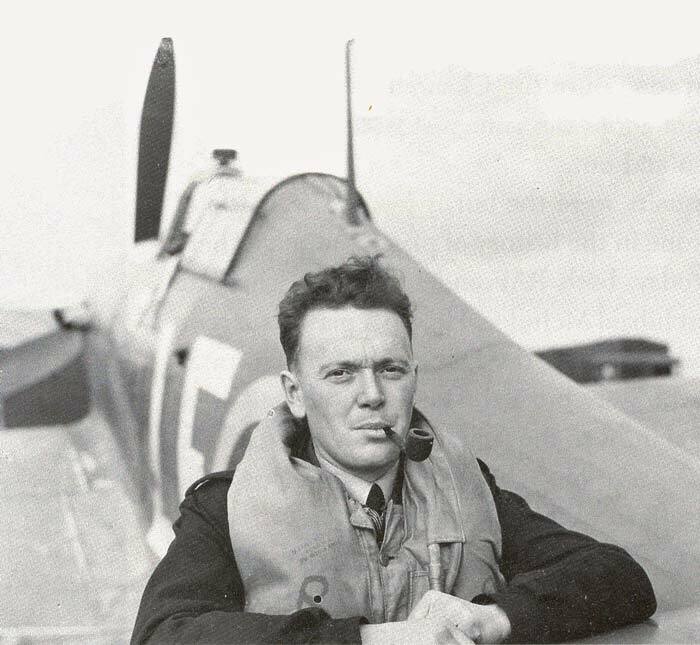 On 19th November 1943 Turner became Wing Leader of 244 Wing and on 8th February 1944 he damaged two Fw190's. He was awarded the DSO (gazetted 23rd May 1944) and posted to HQ Desert Air Force on 26th May 1944 as a staff officer. In June he went to Corsica for the invasion of southern France. In October 1944 Turner returned to the UK, was promoted to Group Captain and given command of 127 (RCAF) Wing. Turner sailed in the Mauretania for Canada on 22nd March 1946. He remained in the RCAF until 1965 and died in Ottawa on 23rd July 1985.